Patrick Allen & Associates are pleased to announce the replacement dwelling that is Marton Cottage in Woodbridge is now complete! The scheme was designed to visually retain the form and quaint style of the existing cottage with the addition of small scale extensions to the south and west. As the property is in a conservation area, one of the ways to ensure the project’s planning approval was to keep the same details of the barge boards,the size of the windows and dormer as they were originally built. Patrick Allen & Associates are pleased to announce that the proposed veterinary extension to house their new state of the art CT Scanner is nearing completion! The materials chosen consider the proposed use of the room. Taking into account the radiation from the machinery, lead lined doors and specialised glass were specified to be used to protect the staff. Patrick Allen & Associates Architects are looking for ambitious Part 2 architectural assistants or architectural technicians to help deliver a diverse workload of exciting projects ranging from small scale domestic through to large scale housing and commercial developments. Candidates would ideally have a minimum of 2 years industry experience combined with a good technical knowledge and excellent AutoCAD, Photoshop, Sketch-Up, and visual presentation skills. Please reply with C.V. and relevant examples of work by email for the attention of Mr Andrew Catton, to architects@patrickallen.org.uk. Patrick Allen & Associates are pleased to announce that Laundry Cottage, a proposed single detached dwelling in Sibton, has been submitted to the local planning authority for formal planning approval. Patrick Allen & Associates are pleased to announce the project of a single storey extension at the Street Farm Day Nursery in Elmswell has been successfully completed. This project has provided the nursery with the necessary space to allow them to expand their student capacity. 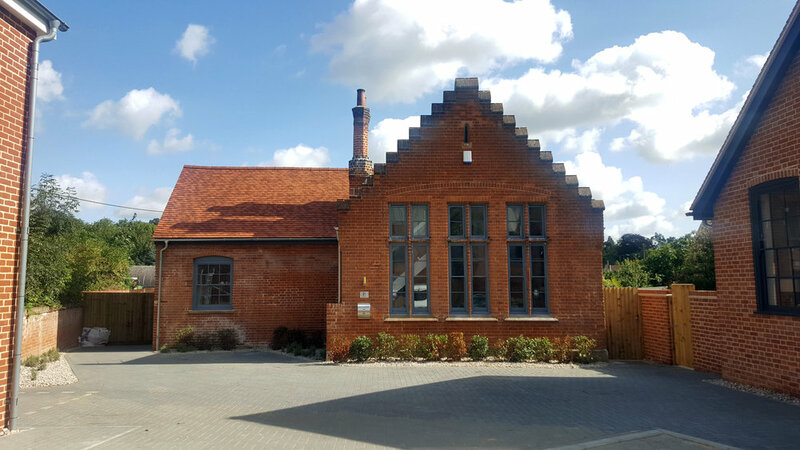 Patrick Allen & Associates are pleased to announce the project of 5 new contemporary builds and 2 converted school buildings at the Old School Mews site in Melton, Woodbridge are all complete and sold. A display of great craftsmanship and design sitting comfortably within its surroundings, seamlessly blending old with new. Patrick Allen & Associates are pleased to announce the replacement dwelling in Waldringfield is progressing very well and on course to be finished December 2018. Patrick Allen & Associates are very excited to announce the successfully secured planning permission for a state of the art teaching block at Finborough School in Great Finborough. The construction of the building will be the first of its kind in the UK to include a state of the art heating system from Scandinavia as well as being built using an off-site pre-fabrication construction method. The proposal endeavours to provide some much needed additional teaching space at Finborough School. It will be purpose built and designed to suit the specific needs of the school, whilst also being flexible enough to adapt to its ever changing requirements going forward. 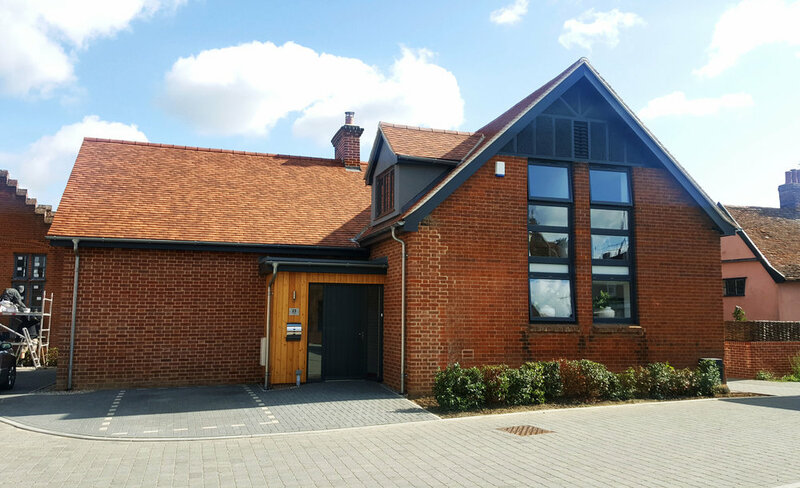 Consequently, it enables the school to continue to operate long into the future, whilst also providing some ‘state of the art’ contemporary teaching spaces to its pupils. Patrick Allen & Associates are pleased to announce the completion of another successful project in Playford. This stunning private residential dwelling is an inspiring, contemporary dwelling designed to sit comfortably within the surrounding landscape. Split over 3 levels, the rooms were arranged to have a generous amount of space and ample sunlight flooding the rooms. Fitted with beautifully crafted kitchen units and an elegant solid wood, semi circular staircase that sits proudly in the centre of the home. Progress is well underway as we near the half-way point of this 12 month "design and build" contract for 13 new dwellings at Brantham in Essex. Patrick Allen & Associates are pleased to announce that works have recently commenced on site for a replacement dwelling in Waldringfield. The site is situated on the Bank of the River Deben on the Suffolk Coast and Heath Area of Outstanding Natural Beauty. The proposed 2 storey dwelling will replace the existing bungalow with complimentary materials and the clients preferred "New England" design to sit comfortably within its surroundings. The new dwelling was designed to give the occupants all of the modern amenities and facilities that the present bungalow is currently lacking. Patrick Allen & Associates Architects are looking for skilled Part 1 / Part 2 architectural assistants or junior technicians to help deliver a range of exciting projects. 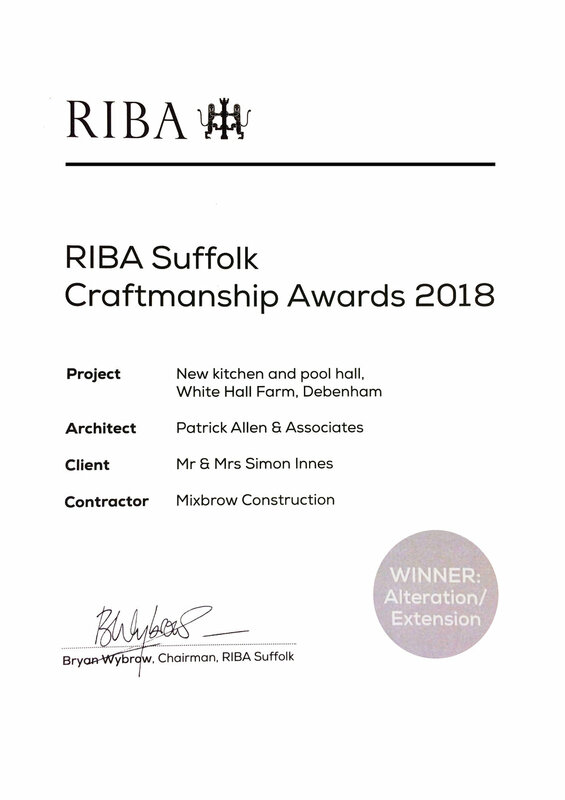 Patrick Allen and Associates are proud to announce that their involvement alongside Gipping Homes on the development of The Bartlet Hospital conversion into flats has won the RIBA Suffolk Craftmanship Awards 2017 under the Restoration category. The project has been ongoing since July 2012 and a lot of hard work has gone into the detailing of the architectural features, resulting in a beautifully crafted restoration project, keeping the original features of the Bartlet Hospital whilst breathing new life into the building. "Probably the most controversial in the re-use of old buildings has been the Bartlet Convalescent Home in Felixstowe, successfully and remarkably converted into apartments by Peter Blemings (Gipping Homes). The whole building sits on top of a Martello tower, the base of which is now a feature on the landward side. It has been converted without losing any of the character or appearance of the previous use. In fact, some locals suggested that the restoration has improved the building, tidied up overgrowing greenery and repaired the damaged fabric." Recently re-opened, the Turks Head Public House has won the title of Suffolk's Best Pub and is now hoping for national honours. Patrick Allen & Associates Ltd are proud to have been the designers involved in this renovation and extension project which is proving to be a very successful venture for our Clients. Patrick Allen & Associates Ltd, in partnership with Evolution Town Planning LLP, recently achieved planning consent on a difficult site adjacent a Grade II listed building. The Local Planning Department gave very positive feedback, describing the concept as "an eminently high design quality, utilising a green sedum, mono-pitch roof form and partial earth sheltering to substantially reduce the visual intrusion from the roadside." Patrick Allen & Associates Ltd. have recently obtained planning permission for works at the former School Site in Melton. Two former school buildings will be refurbished, extended and converted in to habitable accommodation. The site will also boast five new dwellings, two of which will be detached, with a row of three terraced houses facing the site entrance. A use of modern materials will provide an interesting contrast between past and present in the sensitive Woodbridge conservation area.